I am pleased to announce the Editor’s Choice Article for Biotropica 48(4): Diane W. Davidson, Alexey Kopchinskiy, Kamariah Abu Salim, Marica Grujic, Linda Lim, Chan Chin Mei, Tappey H. Jones, Dale Casamatta, Lea Atanasova, Irina S. Druzhinina (2016) Nutrition of Borneo’s ‘exploding’ ants (Hymenoptera: Formicidae: Colobopsis): a preliminary assessment Biotropica 48(4): 518-527. In Brunei, on the island of Borneo, there are ants (Colobopsis cylindrica) that graze on epiphytic biofilms on leaf surfaces and explode when defending themselves. Need I say more? Congratulations to Dinah and her international and multidisiplinary team coauthors for tackling an incredibly challenging and complex isotopic and proteomic analysis of the diet of this fascinating clade of ants. 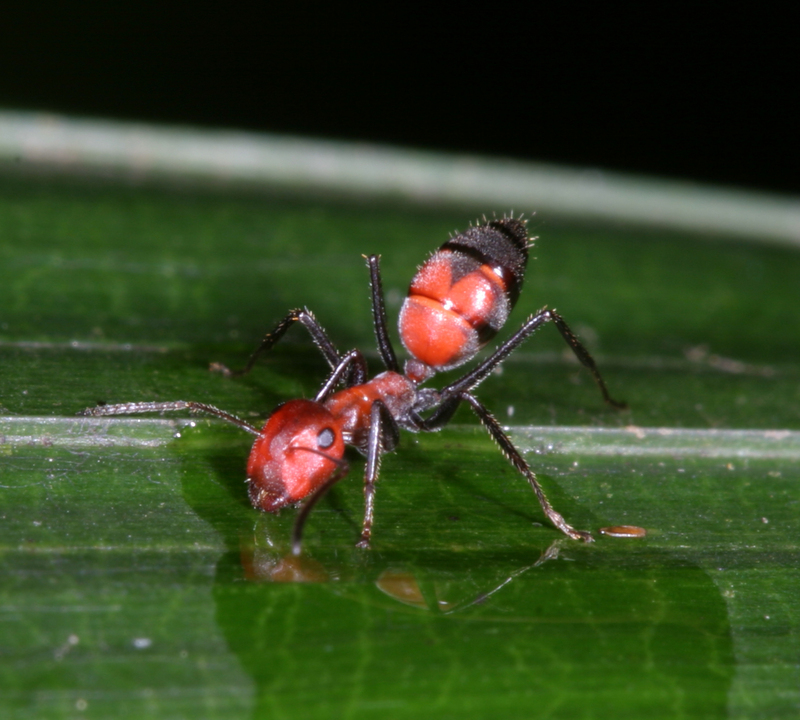 Our studies of Bruneian ants began as a comparative investigation of the trophic levels at which ants feed in New and Old World rain forests (Borneo and Peru). Surprisingly, in both forests, nitrogen isotope analyses identified most arboreal species as ‘apparent herbivores’ (Davidson et al. 2003). Through coauthor Roy Snelling, we gradually identified the most common local species, among them several taxa previously described as ‘exploding ants’ (Colobopsis cylindrica clade). Prior to generic reassignment (Ward et al. 2016), these ants were referenced as ‘COCY’ species. We initially failed to appreciate either how many clade members occurred near Brunei’s Kuala Belalong Field Centre (~12, most still referenced only by descriptive acronyms) or the context in which worker ants sacrificed themselves. Early work (Maschwitz & Maschwitz 1974) had documented extreme hypertrophy of mandibular gland (MG) reservoirs from the head through the thorax and gaster (Fig. 1; Davidson et al. 2011), at some cost to crop capacity (Davidson et al. 2004). In forced laboratory encounters with European ants, Colobopsis burst MG contents suicidally onto opponents (Maschwitz & Maschwitz 1974), but similar behavior remained undocumented in nature. While conducting isotope work, we continued collaborating with Dr. Tappey Jones, an expert on volatile chemistry of ants. He identified the major mandibular gland volatiles of our Colobopsis as phenolic acetogenins, determinations confirmed by Bruneian chemists Dr. Alice Edwards, Dr. Linda Lim, and Dr. Chan Chin Mei (Jones et al. 2004). Phenolic acetogenins are colored white, yellow, orange, and red with progressively higher pH, and colors are species-specific. With MG products visible through intersegmental membranes of worker gasters (Fig. 2), the ants are (literally) ‘litmus paper with legs’. To this day, however, interspecific variation in both types of phenolic acetogenins and product pH remain poorly understood. 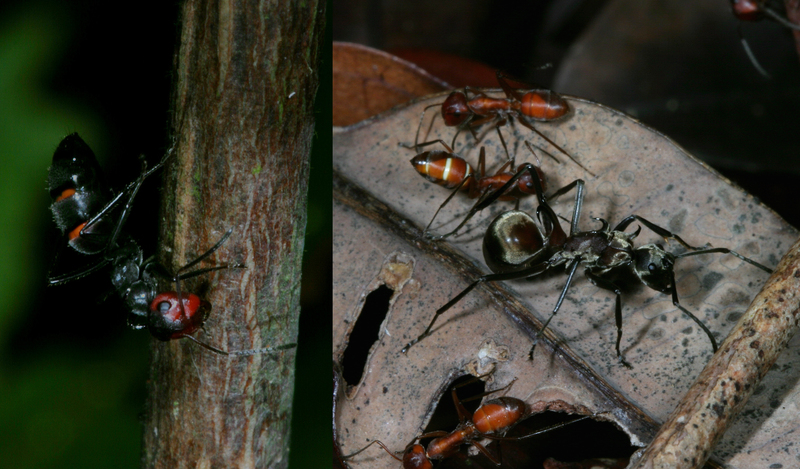 I finally witnessed self-sacrifice in nature when a Colobopsis worker defended a foraging route against a weaver ant by grasping the opponent’s antenna and bursting mandibular gland contents onto its face (Fig. 3). Through foreign worker introduction experiments, we learned that suicidal territoriality against weaver ants, and in intraspecific and interspecific encounters between different Colobopsis colonies, is a derived trait (Cook 2008), regularly associated with defense of arboreal foraging territories by workers foraging solitarily. The basal fighting mode in the clade involves major workers carving up opponents (Fig. 4), and throughout the clade, MG compounds may have alternative or additional uses. As weak acids, phenolic acetogenins should be mildly antiseptic, and the compound occurring most widely across species has been patented as a food preservative with broad antibacterial activity. Products containing caustic m-cresol or resorcinol potentially alter microbial communities in nest wall and carton (Davidson et al. 2009). Sterile workers of several social insects (e.g., honeybees and ‘exploding’ termites) defend colony and queen suicidally. Those of many ant species fight to the death under similar circumstances, or over rich and contested resources. However, voluntary worker sacrifice by Colobopsis occurs naturally in minor workers foraging solatarily in the high phylloplane, and distant from nest, queen and brood. It is also easily provoked by introducing competing ants on haphazardly chosen foraging substrates. After hundreds of hours observing these strictly diurnal ants from canopy towers, or occasionally in forest understory, we continued to puzzle over the nature of food resources. Workers foraged avidly for sweet solutions but did not regularly associate with homoptera, cast-off honeydew, or scavenge dead insects (even on offer). Indeed, they removed carrion and other detritus from upper leaf surfaces where they seemed to graze on microbial biofilms. Contents of buccal pellets can provide indirect evidence of food sources (Wheeler & Bailey 1920). Like other ants, Colobopsis self-groom and compress groomed products into ‘buccal pellets’ within a sublingual cavity (the ‘infrabuccal pocket’). Pelleted indigestibles are typically ejected as waste, but the unusually large pellets of Colobopsis appear to be reduced in situ to lipid-rich material passed posteriorly into the crop, and possibly to larvae. Prior to lipid extraction, they are packed with both fungal conidia and spores and insect parts, likely fragments of dead nestmates and nest-cohabiting crickets (Fig. 5). Interestingly, unrelated spore-feeding ants (subfamily Pseudomyrmecinae) also combine insect parts with fungal spores in food supplied to receptacles on the ventral thoraces of larvae, and Colobopsis larvae have analogous receptacles. Our staining procedure picked up just melanized spores and precluded visualization of hyaline spores, hyphae and yeasts. However, despite difficulties obtaining visual evidence of microbial harvesting in the field, colleague Alex Kopchinskiy has videoed workers pulling white, possibly fungal, material from epiphytic mats on a tree trunk. Coauthor Dale Casamatta ruled out significant presence of cyanobacteria in pellets, and Dr. Kamariah Abu Salim contributed to most aspects of our studies. Sticky MG products could potentially enhance spore capture by workers if applied to tarsi of foragers that periodically groom legs and antennae through mandibles while traversing their territories. (Although these products occur in pellets, work in Dr. Irina Druzhinina’s laboratory rules out presence of digestive enzymes.) Additionally, we suspect that Colobopsis foraging schedules match periods of maximum sporulation by phylloplane fungi, both diurnally and seasonally. If sporulating fungal colonies are primary sources of larval food, this could explain why Colobopsis defend ‘absolute territories’ (space per se), a practice typically associated with continuously renewing resources (Hölldobler & Lumsden 1980). Extreme territoriality (instantaneous suicidal defense) might protect foraging surfaces from microbial contamination. Isotopic analyses, including lichen fungi, could not distinguish dietary contributions of plant sap versus phylloplane fungi and recycled insect chitin. However, pellet contents suggest that nitrogen comes mainly from degradation of fungal and insect chitin. Possible sources of proteases and chitinases include insect molting fluids from crickets (which have complete metamorphosis) or regularly shed linings of Colobopsis infrabuccal pockets. One cell thick, pellet envelopes may be unique to these ant species (Fig. 6). Also, decay of worker corpses may begin within the nest, with chitin degrading microbes incorporated with body parts into buccal pellets. As fungi are degraded, chitosanases could break down chitosan from spores. Lipid products of pellet reduction may contribute sterols required for hormonal control of growth and maturation in these insects. In Brunei’s mostly ever-wet equatorial forests, grazing of plant biofilms by arboreal ant taxa (visually including some Polyrhachis and Echinopla spp.) appears more common than in Peruvian tropical dry forests. Colobopsis themselves are ecological dominants (Davidson et al. 2007), though inconspicuous solitary and high canopy foragers are easily overlooked. Abundance of Colobopsis is obvious where commuting routes (branches and lianas) or polydomous cavity nests have fallen from the canopy. Most conspicuous is daily ascendance of foraging columns to the canopy in taxa with derived nesting habits, including both canopy nests and nests in tree bases and fallen dead wood. Many other species have evolved to take advantage of the Colobopsis, e.g., by mimicking foraging behavior (an unrelated ant, a ‘grazing’ spider). Other ant species either follow Colobopsis to food (Fig. 2; Davidson et al. 2007) or cultivate food retrieved from their nests. Tiny flies (Ceratopognonidae) are quickly attracted to MG products of ‘exploded’ Colobopsis workers (D. W. Davidson, pers. obs. ), and a colorful diurnal and predacious cricket may specialize on these ants despite their sticky contents. However, the most important ecological questions remain unexplored. What (if any) effects might these ants have on plant pathogens and beneficial epiphylls (even endophytes), and what consequences might there be for plants where these ants forage? Insect-microbe-plant interactions in the rainforest canopy remain a ‘tough nut to crack’. Cook, S.C. 2008. Functional and nutritional biology of exudate-feeding ants. Ph.D Thesis, University of Utah Press. Davidson, D.W., N.F. Anderson, S.C. Cook, C.R. Bernau, T.H. Jones, A.S. Kamariah, L.B. Lim, C.M. Chan, and D.A. Clark. 2009. An experimental study of microbial nest associates of Borneo’s exploding ants (Camponotus [Colobopskis] species). J Hym Res 18: 341–360. Davidson, D.W., S.C. Cook, and R.R. Snelling. 2004. Liquid feeding performances of ants (Formicidae): ecological and evolutionary implications. Oecologia 139: 255–266. Davidson, D.W., S.C. Cook, R.R. Snelling, and T.H. Chua. 2003. Explaining the abundance of ants in lowland tropical rainforest canopies. Science 300: 969–972. Davidson, D.W., A.S. Kamariah, and J. Billen. 2011. Histology of structures used in territorial combat by Borneo’s ‘exploding ants’. Acta Zool 93: 487–491. Davidson, D.W., J.-P. Lessard, C.R. Bernau and S.C. Cook. 2007. The tropical ant mosaic in a primary Bornean rain forest. Biotropica 39: 468–475. Jones, T.H., D.A. Clark, A. Edwards, D.W. Davidson, T.F. Spande, and R.R. Snelling. 2004. The chemistry of exploding ants, Camponotus spp. (cylindricus complex). J Chem Ecol 30: 1479–1492. Maschwitz, U. and E. Maschwitz. 1974. Platzende Arbeiterinnen: eine neue Art der Feindabwehr bei sozialen Hautflüglern. Oecologia 14: 289–294. Ward, P.S., B.B. Blaimer and B.L. Fisher. 2016. A revised phylogenetic classification of the ant subfamily Formicinae (Hymenoptera: Formicidae), with resurrection of the genera Colobopsis and Dinomyrmex. Zootaxa 4072: 343-357. Wheeler, W.M. and I.W. Bailey. 1920. 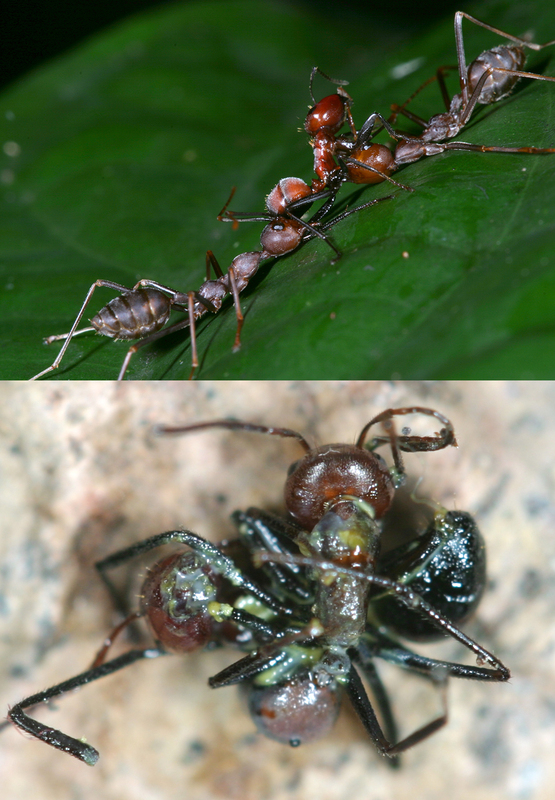 The feeding habits of pseudomyrmine and other ants. Trans Amer Phil Soc 22: 235–279.